Rubber valve stem seals adopt non-burr and one-step injection molding. 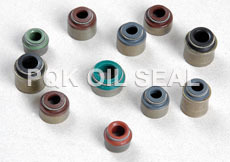 It controls the gap between valve rod and seal, to play the best sealing effect. PTFE valve stem seals are resistent against heat and abrasion. It thoroughly improves the sealing stablity and reliabilty when the valve stem is in high-speed motion. Zhejiang Shangyu Oil Seal Co.,Ltd is a leading China valve stem seal manufacturer and supplier, our valve stem seal factory can provide customoers cheap valve stem seal products. Welcome to buy discount valve stem seal or wholesale products from us.